Written by Joel on September 19, 2013 Blog. Just under a month ago we received the news from 8bit that they were closing down shop. Over the years, we here at WooThemes have developed a lot of respect for John and the team at 8bit so we were certainly surprised and disappointed to hear the news. Businesses operating in this WordPress landscape know well how challenging it can be to thrive and sustain a product. I think we all recognise that Standard Theme was an incredible product. Standard Theme has been described as “incredibly easy to use with just enough options to be powerful, then it backs off”. Following the announcement, a number of us here at WooHQ took a bit of time to read through the comments and various blog posts published in response to the news. Here is a quick sample of what the 8bit community said about the announcement. We realised pretty quickly that we couldn’t sit back and let Standard Theme die. Thus, we decided to approach John and the 8bit team with a plan to take over Standard Theme and look after it for at least the next year (up to WordPress version 4.0). We feel this move will be a great benefit to the many users of Standard Theme and will overall be a pivotal move for the WordPress community to ensure Standard Theme is bug-free and compatible with the upcoming WordPress releases. While we will be looking after Standard Theme for the next year, we’d like to confirm that we will not be selling Standard Theme on WooThemes.com. We will be contacting all Standard Theme users directly in the next few hours with more information. If you aren’t familiar with WooThemes, we’d like to take this opportunity to welcome you to the Woo Family. We will do our best to take good care of you. Thank you to John and the 8bit crew for giving us this opportunity to take care of your product and amazing community of WordPress users. We hope you enjoy the journey with us, while we work to keep Standard Theme alive and well. Wow. I didn’t see that comming! New home for Standard Theme. That’s nice for all its users… and nice for WooThemes too. Sure you’ll get some new customers. Good move! Wow! This is fantastic news! As a designer who’s been in search for a new WordPress Theme home since 8BIT’s announcement, this has just made my decision making process more interesting! I’ve had quite a bit of personal brand stock invested into Standard and this may have just breathed new life into my digital strategy. Thanks Woo Team! I can’t wait to see what you guys can do with Standard! Hey Dustin, this is great to read. We hope to impress! That’s great to hear. Interested to see why direction you take the theme in. Awesome to here it will be free. Just a clarification here. We’ve not said that Standard theme will be free (other than bug-free) in the above blog post. Standard Theme will not be for sale on WooThemes.com. It will be available to customers who purchased through 8BIT previously. When I login to Woo Themes, I don’t see Standard Theme in My Downloads so that I can transition my account. Help? “While we will be looking after Standard Theme for the next year, we’d like to confirm that we will not be selling Standard Theme on WooThemes.com.” Does that mean after one year Standard Theme will be dead and there will be no more updates other than bug fixes? We can’t make any predictions at the moment. A lot can happen in a year, but we plan on accommodating all Standard theme users as best we can. I have only recently come across John’s work (over at Pressgr.am) but if that’s anything to go by then Standard (which I dont profess to have used) is surely worth the investment. What might this mean for WooThemes customers? I use Canvas for almost all projects and can’t help onder if you have put any thought into bringing the two products together? We’ll be doing a thorough review of the Standard theme and see if there are any features we can enhance Canvas with. Canvas and Standard Theme do different things, and there is value in that. Canvas is useful starter theme for just about anything, that even guys like me can get something going. That is pretty cool if you want to just start something. Standard Theme is a pure blogging theme, and I hope it remains as such. There are few theme options, and no custom post types. There are also some very good child themes that are available. There are however a couple of points that might be helpful for the woothemes framework. 1. Widgets: For me, being able to choose a widget to place under article page content is a cool feature of the standard theme. I prefer this over the “subscribe and connect” box built into woothemes. Could be pretty useful given the new visibility options built into Jetpack. On the plus side for canvas, it handles related posts really well. 2. The “social influence” widget in Standard is also interesting. If it continues, LinkedIn would need to be included. The good point is that the Standard social widget looked really well coded. It just loaded really quickly compared to other social profile solutions. 3. Standard Maintanance Mode/ Coming Soon options worked really well, and is included in the price of the theme. Keep that as it is. I might just upgrade my standard themes license for updates. This is amazing news. I’m very excited. I was heart broken when 8bit announced their closing. Now I suddenly feel revived. I’ll miss the 8bit team as a unit, but I’m sure that Standard is in good hands. Will you be providing WooCommerce theme support for the Standard at least? We will look into exploring this, yes. Thanks for taking the reigns and coming up with something awesome for our customers. I’m glad to know they are in good hands! Happy to see that the Standard Theme lives on. I personally use this theme, and I’m happy to see that it will continue to be in good hands. One question, however, any word if the theme will be back on WordPress.com? Yes, we plan to keep the theme on WP.com also. Nice one, very happy to here this! I don’t understand how to transfer my Standard Registration info to Woo Themes. Help! If you’ll create a WooThemes account using the email address you used with Standard, there will be a banner at the top of the Downloads page. That was the confirmation for me. Feel free to contact us via our contact page if you have any trouble setting up your account. There will be avaible to membership?? O will be apart? Standard Theme will only be available to those that bought it via 8bit. Let me get this straight. You didn´t want a theme(Standard) to dissapear from the internet since 8bit was closing so you got in contact with the people behind theme theme to see if you could take over said theme. But this is only for the people who already have the theme bought from the previous owners and the only thing you will be doing is keeping it up to date so that it works up untill WordPress 4.0? You will not “rerelease” it as a new theme from WooThemes nor will you be selling it allowing for new users to aquire the theme? So it is only for old customers that this theme will live on? But only for 1 year? Then after that the theme will still get laid to rest? Is this way of reading and understanding this post correct? Or have I missed something? If I´ve understood this correct then I don´t see the positive effect this would have. It´s prolonging a lifeline for one year and then it´s going to be cut? The positive effect would be that the current users of ST will still be able to use their theme, and get more time working on a strategy for moving on. Yes that is true. For users that have bought the theme and have clients using said theme to get a whole year of support and updates as a time-limit to move to another theme or find another solution for the busniess is good. I just thought that if you say something will “live on” as a big grandeur thing then the lifeline would be more than one year. But that´s me and my way of thinking. And as per usual when it comes to themes I want to see it in action to see what it´s qualities are. I love looking for new designs in whatever ways are possible. As someone who just got Standard integrated a few months ago, I’m very pleased to see WordPress compatibility and presumably security updates for another year. It’s quite costly in terms of time and energy to implement a new solution, so this is a whole lot of breathing room… that I appreciate. Regarding the Canvas promo we were offered, 1 year of Canvas versus 1 year of Standard takes me to the same place in time… You might have more takers if you offered up any theme and with a 2 year license. Understandable that you would find it a happy occasion. One more year with a theme that is integrated into your plans and everything. Implementing a new solution usually takes a lot of time and energy and maybe above all money. So good for you. I haven’t received en email yet… how long should I keep a lookout for? Can you recommend a Woo theme that is comparable to Standard? I used Standard Theme out of the box, with no customizations, to build The Joy of Moldings and it has worked well for me. But I’d rather transition to an existing Woo theme that will be supported for years to come. My advice would be to consider Canvas for your needs – it really is well supported and to be honest can be used for anything and everything. Plus you should have received an email with a coupon to help you transfer easily to Canvas. I’m seriously considering this. How does Canvas handle post formats? One thing I love about Standard is how beautifully these are displayed. A coupon? I like coupons. Thanks a bunch. 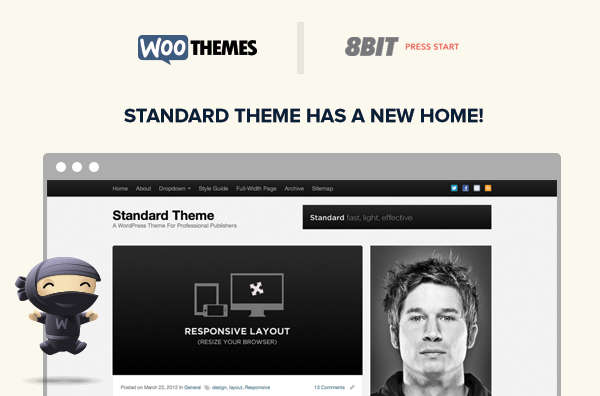 Standard theme is now Woothemes’ best theme. I vote for turning standard into a canvas child theme. I read the conversation about making all woothemes canvas child themes and I think it’s the best idea ever. Woothemes has been slacking on themes since the release of woocommerce. Maybe create a canvas marketplace just like the woocommerce extensions marketplace. This would bring woothemes tons of cash like woocommerce did and woothemes users more diversity in creativity built on top of the awesome canvas framework. BTW can you please answer ticket#100963 All my purchased downloads are gone and I need to download a payment gateway. Hi Guys, Standard has somehow disappeared from my woothemes account. What’s going on? This is great news, it’s a theme I really liked. The Canvas theme looks like a nice alternative for the future though. Bummer! This is the first I’ve heard about it. Was never contacted about the change and since I bought the support and upgrades package that’s a bit disconcerting. What do I have to do to get in the loop? Why there is not a Standard theme page in Woothemes site? Standard will be supported in the future by Whoothemes?? There is possibility to have an offer for buy canvas a special prize for standard users? I spent 70 euro for standard life license that i used only for limited time and if there is an offer i’m intrested tu buy Canvas. I’m getting in on the tail end of this conversation, and I’m truly bummed that 8Bit has gone the way of the dinosaur. Is there a time frame available for when Standard Theme support will be available from Woo Themes? In the Standard Theme options inside WordPress, none of the upload options work any longer, which is effecting my need to change out a few ads. Any help would be greatly appreciated! Nice, I had just purchased Standard a few weeks before 8Bit decided to call it a day. I’m glad that it will still be supported. With version downloaded from woo i non see my header, i redownloades last version from standard suppord and i seee agin my header again, strange. Hey Woo, how about forum area for Standard users. Make us feel welcome here. And give us that platform to collaborate. Thus far, I don’t see the point of the acquisition and been looking at Genesis stuff for my next move. Since Standard isn’t for sale on Woo, do you know if it is, or will be, available to purchase or download elsewhere? A question about Standard Theme support. Dear all I have bought standard theme from 8Bit, but with the latest update of WordPress (3.7.1) I have problems of uploading images in posts. I’m not quite sure where I can go for support and I would like to know how to fix some problems with the theme. Any ideas.